For me, Summer is one of the best times of year! Its about fun, sun, longer and warmer days, and more time to hang out with friends since school's finally out! It's also a really good time to go camping! 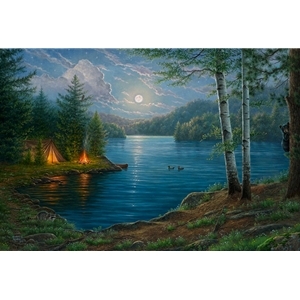 I have very fond memories from growing up of sitting around a campfire, watching the moon rise, hearing and seeing all of the animals in the darkness, listening to the endless melody of the crickets chirping, eating Smores, and laying in the soft grass slowly drifting off to sleep. We all need times of still and quiet to reconnect and let the world slowly turn without us having to worry about the stresses of everyday life that constantly bother us. A simple campfire has helped me time and time again. Its God's way of stress therapy I suppose. I hope I have captured a little slice of the solitude and quiet in this piece for you to enjoy. Its that magical time of night, when the summer sun has set behind the trees and the moon begins to sleepily climb in the night sky. That's when all of the nocturnal critters of the forest begin to crawl out of their daytime hiding places and take advantage of the cover of darkness to feed, hunt, and play. Its the perfect time to relax by the fire, listen to the melody of crickets and soothing lapping of the lake's waves, and enjoy the beauty of a Summer Night.